30/12/2015 The CWGC record Private John McNally as the son of John and Harriet McNally, of Derry, Coalisland, Co. Tyrone. 30/12/2015 Mr John McNally, Derry, Coalisland, has received the distressing intimation that his son, Private John McNally, Royal Irish Fusiliers, was killed in action on the 6th September. 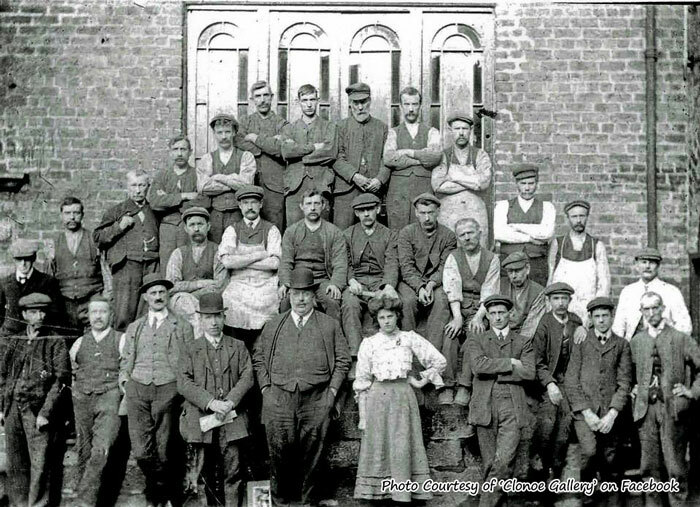 Prior to volunteering the deceased soldier was in the employment of Messrs. L Clark & Sons Ltd, Coalisland..
30/12/2015 The photo above is believed to be a photo of the staff of Coalisland Weaving Mill, Ledlie Clark & Co. The photo was taken in 1909. 30/12/2015 Intimation has been received by Mr John McNally, Derry, Coalisland, that his son, Private John McNally, Irish Fusiliers, was killed in action on the 6th September. Prior to volunteering he was in the employment of Messrs L Clark & Sons. 30/12/2015 Private John McNally was killed in action in the Somme region on 6th September 1916, age 30. 30/12/2015 John enlisted in Coalisland. He was originally with the Royal Inniskilling Fusiliers (20307) but was transferred to the 7th Battalion of the Royal Irish Fusiliers. 30/12/2015 Family: John McNally, Harriet McNally, Kate McNally (born about 1883), James Joseph McNally (born about 1885), John McNally (born about 1887), Michael McNally (born about 1889). 30/12/2015 The 1911 census shows John as 24 years old. He was still living with the family at Derry, Tullyniskane, Tyrone. John worked as a cotton drawer-in for Ledlie Clark & Co., a weaving factory in Coalisland. 30/12/2015 The 1901 census records John as 14 years old. He was living with the family at Derry, Tullyniskane, Tyrone. He had left school and was working in a factory. His father is a labourer. 30/12/2015 John McNally was a son of John and Harriet McNally of Derry, Coalisland, County Tyrone. He was born in Coalisland about 1886.